New York : Puffin Books, 1979, c1954. 128 p. : ill. ; 20 cm. The hard winter that Analdas, the old Rabbit, prophesies comes to pass in more ways than one for the dwellers of Rabbit Hill when the "Folk" go away and leave a neglectful Caretaker with a mean Dog in charge. 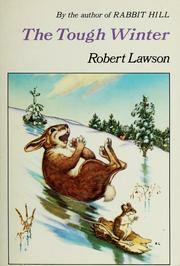 The tough winter / by Robert Lawson. Animals, Legends and stories of. $d Dates associated with a name 1892-1957. $c Statement of responsibility by Robert Lawson. $c Date of publication, dist, etc 1979, c1954. 520 Summary Etc. $a Summary, etc. note The hard winter that Analdas, the old Rabbit, prophesies comes to pass in more ways than one for the dwellers of Rabbit Hill when the "Folk" go away and leave a neglectful Caretaker with a mean Dog in charge. 650 Subj:Topic 0 $a Source other than LC Animals, Legends and stories of.